Chickweed is one of my favorite herbs. You can use all aerial parts of the plant. My husband has gotten into trouble more than once when he got rid of it from garden beds. Chickens and small birds enjoy feeding on Chickweed as well – probably the reason for its name. 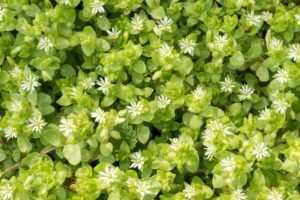 Chickweed is very nourishing, it contains many minerals and vitamins such as vitamin C, copper, iron, phosphorus and potassium. My preference is to use Chickweed raw in salads, added to smoothies and the Jungle Juice, and as a garnish on sandwiches and in wraps. The flavour is mild and as with many herbs the younger plants are preferable. Especially when using it raw for salads and toppings, the stems of more mature plants get stringy, so you may only want to us the (flowering) tops. Try mixing it into cream cheese or make a herbal butter by adding chives and chickweed and maybe a bit of flax oil. You can also add Chickweed to soups and other cooked dishes. However, you don’t want to cook Chickweed for more than a few minutes; therefore I suggest you add it towards the end after any other vegetables and greens have their required tenderness. Medicinally Chickweed is very soothing to the skin. I like to use it externally for skin conditions such as eczema and itchy skin. It also has a cooling effect. Apparently the herb is also used as a tea in natural weight loss programs; however, I do not have any personal experience with this application. Less well known is the fact that Chickweed helps to soothe stomach ulcers and other digestive ailments. Have fun, be creative and I hope you will enjoy Chickweed as much as I do.